Hako management sent a cab driver to the Hamburg airport to pick me up. As he turned his Mercedes into the Hako factory, my first impression was that the place wasn't all that imposing. The building I saw initially was just a low-slung, single story affair with nice signage. Then, as my eyes traveled the extensive width and length of the structure -- and I realized this was only one of several substantial company buildings surrounding the central parking area -- I had to re-assess my initial perception. The 1+ million square foot Hako 'campus' was modern, neat and well kept, with the no frills, businesslike layout one might expect from a German manufacturer. This is the location where what is now called 'Hako-Werke GmbH' started, a few kilometers outside Hamburg in a town called Bad Oldesloe. Hako is one of Germany's largest private companies and a leading manufacturer of floor cleaning machines and grounds maintenance equipment. The on-site house first used by the founder is still occupied by 2nd and 3rd generation family members. Today, the company is owned largely by the families of the son and son-in-law of the initial founder. However, this initial Hako location has become just the central component of a worldwide manufacturing and marketing empire. The company owns subsidiaries in Europe and overseas, as well as having representatives and partners in almost all important markets that promote and sell Hako's products and services. In addition to outdoor sweepers, the types of equipment the conglomerate now makes and sells include in-plant sweepers, scrubber driers, pressure washers, tractors and agricultural machinery. I'm meeting with Alexander Schless, the company's Export Manager, and Product Manager Nils Toennesen. In the photo animation, the dummy in the middle is holding the first-ever product manufactured by the Hako organization. Made in 1924, it's an agricultural cultivator. After brief introductions they usher me to a conference room where they show me a nicely produced PowerPoint-type presentation full of facts about the company's history, growth, acquisitions and product lines. After that, we head to the company lunchroom, where several hot lunch choices -- all apparently cooked onsite -- were available to choose from. Alexander then excused himself for a meeting and Nils took me on a tour of the factory. The inside of the plant appeared to be the end result of years of efficiency studies. Our first stop was in the spare parts area, where row after long row of racks stretched to the ceiling. All were serviced by an automated parts system that operated in between them. Humans were not allowed to walk in between the racks at all, nada, zilch. That's not to say the aisles weren't busy, though; manned lift-carts machines were continuously plying in and out. It was a very busy place. No wonder: Nils said their standard stock consists of approximately 21,000 different spare parts. The company goal, which he said they stay pretty much on target with all the time, is to consistently have 98% of customer-ordered parts in stock. "Our customers are at work every day with our machines," Nils told me. "When that stops we know they have expenditures, and when the downtime goes past 24 hours they need replacements. We want to get our customers going faster than a car manufacturer in the United States would." That philosophy, along with the design and infrastructure commitments I would soon see more of, has propelled Hako to become Germany's leader in the city cleaning marketplace. In the U.S., this would be comparable to what we might call the 'plaza' or 'inner-city' sweeping sector. However, in Europe this market is much larger than in America. That's because most European cities have narrower city streets and many more footpaths than on our side of the Atlantic. So, the smaller sweepers Hako specializes in are used in a much larger share of their marketplace. Hako was founded as an agricultural equipment builder, and didn't start into the sweeper business until 1961. Along the way and since then there have been a number of acquisitions worldwide. One of these was the Minuteman company in the U.S., which they bought in 1980 and through which Hako now owns PowerBoss, Multi-Clean and Parker (indoor sweepers, blowers, etc.). Hako entered the Japanese sweeper market in 1981, and are today the largest sweeping company in that country. In 1994, Hako had the distinction of developing the first autonomous cleaning robot. This project is still ongoing, and they introduced an updated model in 1996. However, I was told the concept still isn't cost-effective to use. The company's first entrant into the outdoor cleaning market, what is now become the Citymaster 1800, didn't occur until 1995. Worldwide, Hako companies turned US$490 million in 1999, $533 in 2000 and $523 in 2001. Although figures for last year weren't readily available, I was told it was the best in history, as was the first quarter of 2003. Currently, the company builds 3 outdoor models of sweepers. All are called 'Citymasters,' with number designations that increase with the hopper size of each. The Citymaster 90, the smallest of these, has a usable capacity of 120 liters and offers twin-cylinder high dumping into standard garbage bins. As you can see in the photo, it's a ride-on unit that has the driver out front, just behind the twin curb brooms, and is designed to be a superior choice when compared to walk-behind sweepers. The 90's hydraulic rear wheel steering gives it a turning radius of 6.3 feet, which is almost 25% less than the machine's 8' 2" length. The Citymaster 90 is powered by a 2-cylinder, water-cooled, diesel engine that generates 14.9 hp at 2700 rpm. Drive is hydrostatic and, because of where the operator's seat is located, visibility is outstanding. Although at the moment the driver is out in the open to the weather, I'm told an all-weather operator's cover is in the works. A hand-held suction hose is also an available option. During the tour, one of the 90's had just come off the assembly line and was being tested outside the open factory doors. To get a better assessment of the sweeper's turning radius, we asked the operator to turn it in a circle while I snapped photos. You can see the results in the animated picture to the left. Next up the Hako sweeper ladder is the Citymaster 300, the innovative machine I previously reviewed in detail at the Aviemore, Scotland trade show earlier in the trip. That's when I first learned I could put the Hako factory location on my list of stops. If you didn't have a chance to look at it then, here's a link so you can read about it now. The 300 is definitely making waves as a result of its unique 'wheelie bin' dumping system. At the top of the Hako line is a 2.22 cu. yd., purpose-built machine called the Citymaster 1800. This sweeper meets the tough Euro 3 Emission Standards (meaning exhaust emissions are at least 35% below the previous Euro 2 levels), and is designed to sweep at speeds of up to 9 mph. The engine is a 115.7 cu. in. diesel that generates 83.6 hp at 3000 rpm. On the road, the 1800's purpose-built chassis can travel between jobsites and back to base at a top speed of 31 miles an hour. Like the model 300, dust suppression water is sprayed over the gutter brooms, not via a spray bar. This is to ensure a minimum of dust coming from the brooms, very important since the machines typically operate in relatively confined spaces and around pedestrians. In addition, the 1800 is outfitted with an internal water spraying device to ensure exhausted air is also clean. This system uses the dirty water brought on board during sweeping. Water that is vacuumed up is passed through a 'dirty water sieve,' and then returned to a tank designed to hold it. This recycled water is then reused for additional dust control via a water-spraying nozzle located in the suction channel. The blower is infinitely adjustable, a necessary feature when operating on the sand-bedded brick surfaces where these machines are most often used. The suction direction is at a tangent to the road surface, in order to guard against removal of sand between the crevices of brick or paver-built streets. The cabin offered wide visibility and seated two people, and my impression is that the operator would find it to be a comfortable, ergonomic ride. A hand-hose was available, as well as a horizontal front broom designed for clearing snow from footpaths and cycle paths in the winter. The assembly lines for the various machines appeared to be a model of German manufacturing efficiency. A variety of systems had been tried through the years, said Nils, with each change bringing another level of improvement. They had recently moved toward better optimization of how the parts they didn't produce at that location arrived on their assembly line. "All plastic parts are made 30 km away in our Trappenkamp factory," said Nils. "Hoppers are no longer delivered by themselves, but now come as a completed hopper 'kit,' one that is ready to bolt on. In Trappenkamp, we also sub out to do rotational molding for other, independent companies. Approximately 30% of our volume is done for other firms. In total we have 7 production facilities, including this one here in Bad Oldesloe. "Compared to what we did before, our new way of assembly saves us both time and money," said Nils. "We do the same with some of the other parts on the sweepers that lend themselves to this. Our assembly line is now more responsive to current orders, because our customer delivery times are reduced while, at the same time, it costs us less. Saving money and saving time are both items that our customers can appreciate." The area where paint was applied to the sweeper parts was also an impressive sight. Finished parts are hung on a conveyor belt, which is the last time they are touched by humans until after the final coat of paint is dry. In the meantime, they are blasted, cleaned, cleaned again, and then electrostatically-coated with several layers of paint. From the looks of the system, my guess is the paint lasts quite well on the Hako units. After assembly, each sweeper is hooked up to a machine that checks all functions via a computer program. These impartial tests include brushes up and down, brush speed level, downpressure, and confirmation that all the pressures and temperatures are at the right places. At the end, a computer printout providing all the results is attached to the machine to provide a permanent record of the results. From start to finish, a firsthand look at the Hako operation showcased them as a classy company with a commitment to excellence, from design to production to training. 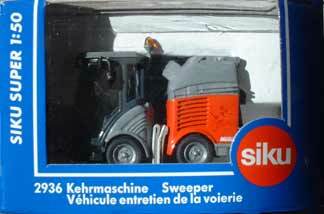 The innovativeness of the features on their current crop of sweepers I also found impressive. All the models offered good ergonomics, attention to detail and, especially in the case of the model 300's use of a standard wheelie bin as a hopper, thinking outside the box. 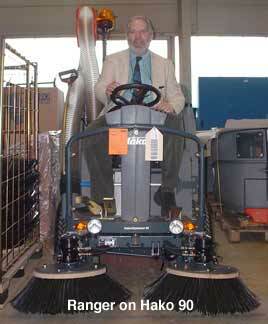 To me, it was no wonder Hako products have taken over the leadership spot in Germany's city sweeper marketplace. Although I would have loved to take home a Hako 90 to clean up around the house, it simply wouldn't fit into my suitcase. So, I settled for the 1:150 scale model of the Citymaster 300 I'd been given. Although, box and all, it was only 4" in length, since I was nearing the end of my trip I even wondered whether I'd be able to fit it into my suitcase! If you'd like to contact Hako, click here to send an email to Nils Toenneson. Although we initially planned an article covering Berlin's annual Christopher Street Day Parade, technical difficulties interceded. So, this concludes our coverage of sweeping in Europe. We hope you enjoyed the articles, and we welcome any feedback you might have on these or any of the information here at AmericanSweeper.com.